If you love to shop — and even if you don’t — chances are you’ve visited a property owned by RioCan Real Estate Investment Trust. Founded in 1993, RioCan is Canada’s largest real estate investment trust (REIT), with a total enterprise value of approximately $16 billion as of March 31, 2015. RioCan owns and manages Canada’s largest portfolio of shopping centres, with ownership interests in a portfolio of more than 350 retail properties throughout North America. 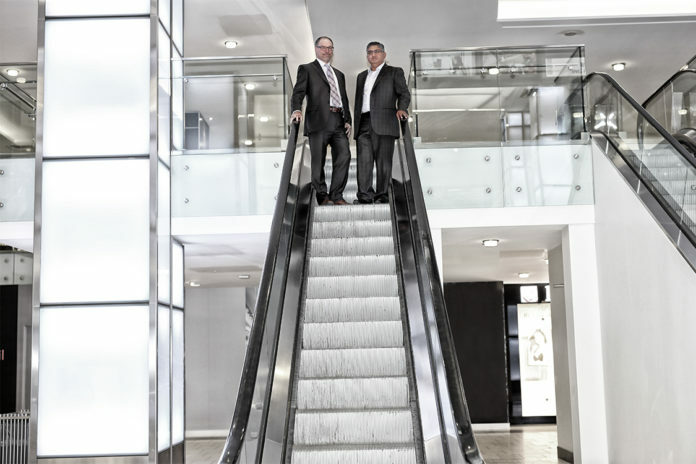 RioCan’s success and growth has traditionally been through the buying, managing and selling of properties; this amounts to interests in approximately 80 million square feet of commercial property, typically in the form of shopping centres anchored by national tenants and mixed-use development locations in both U.S. and Canadian markets. The retail industry landscape is fast-moving and fast-paced; RioCan needs to anticipate future tenant demand and market growth. But to be an organization as large as RioCan and still maintain a high degree of IT agility requires planning, foresight and collaboration. And as a large and distributed organization, coordinating the technologies and processes on the backend to support this growth can be a tall order. For RioCan, sustainable business growth revolves around technology advances, according to IT Director, Nadeem Hussain. The organization’s legacy technology and data centre, however, was due for a hardware refresh. RioCan wanted to avoid a situation where it was operating “end of life” technology which comprised of several generations of servers and storage with differing degrees of performance: “As our hardware footprint and collocation costs needed to be kept constant, we determined that a unified and scalable infrastructure was required for growth,” said Hussain. “On the IT side of things, we are modernizing our core infrastructure, establishing flexible technology growth paths while also creating new standards across more than 350 properties in a seamless way – it is quite a challenge,” said RioCan IT VP, Renato Vanin. He added the organization currently maintains a collocation partner agreement, meaning that it is mission-critical to optimize footprint size and power consumption to help reduce its general and administrative costs. RioCan recently developed a proactive three-year timeframe for technology optimization involving a comprehensive IT review and audit of its environment. In order to refresh its entire data centre, RioCan sought to boost storage capacity and migrate away from its aging legacy infrastructure. Adopting a converged infrastructure would help simplify management and free up resources for greater innovation, noted Hussain. CDW Canada was selected to help develop the right-sized configuration for its needs, according to Vanin; the organizations worked to develop and implement an IT convergence plan that integrated products from HP and Oracle. Working together, it was determined that leveraging new servers, data storage devices, networking equipment, and virtualization software would help streamline and optimize the data centre for RioCan’s specific technology requirements and workload. This included an HP Converged System solution along with rack blade and database servers. The organization ultimately collaborated with CDW Canada for procurement and ongoing technical support. Deploying and configuring the new HP converged infrastructure environment was a unified process, noted Hussain. The key to project success was being able to “bridge the gap” between the original conceptual plan and the real world implementation. “We were operating with a tight timeline, and the CDW Canada team worked around the clock to present practical solutions to challenges and help identify the best and most cost-effective configuration on time and on budget,” said Hussain. Specifically, the HP converged solution environment enables RioCan to operate within a smaller hardware footprint than the previous legacy environment, optimizing network infrastructure and capacity across its many properties while increasing the capability and growth scalability. The new integrated technology architecture features superior availability, rendering time and stability, all of which helps RioCan enable greater agility and flexibility while boosting productivity and cost controls. For example, the organization is taking advantage of blade servers, network optimization and virtualization tools to more efficiently use distributed resources — meaning the IT team has greater flexibility to allocate and reallocate resources to scale on demand or add new services more quickly. The goal was simplicity and scalability, while still maintaining the physical hardware and energy footprint, said Vanin, adding RioCan is taking advantage of the new converged infrastructure, which is easier to manage and has also served to reduce operation and administration costs. Currently running 250 virtual server configurations on 14 physical server hosts, RioCan is realizing 30 per cent growth capability within the new environment. With the new infrastructure in place, the value proposition for RioCan includes the increased capacity, flexibility of resources and reduced hardware and power footprint. “We have 30 per cent additional rack space in one HP converged system. For us, shrinking from two racks to one rack was a big win,” said Hussain. Moving forward, RioCan continues to grow through its existing real estate assets and also new real estate acquisitions and redevelopment opportunities. With the new converged infrastructure in place, the organization can worry less about its internal technology processes and focus more on its industry standing and future growth, noted Vanin.